Forever Fit Physical Therapy and Wellness: How Does Fear Change Our Pain? How Does Fear Change Our Pain? On halloween, we decorate houses and dress up in costumes resembling frightening characters or themes. These scares are fun and temporary; in the case of physical pain, however, fear can be much harder to overcome. When we experience pain, fear can be an overwhelming obstacle to reaching former levels of physical activity. Its easy to feel nervous if the pain feels extreme or debilitating. Fear can also allow minor pains to develop into chronic symptoms. Physical therapists call this musculoskeletal fear-avoidance. When we are in pain, we tend to associate an activity with the pain it causes. When pain is new, this fear-pain association is healthy and promotes rest and healing. Avoiding activities that cause or worsen pain can speed up that healing process. Your nervous system and pain sensations are in place to alert you to possible tissue damage and reduce risky activity so you can prevent further injury. 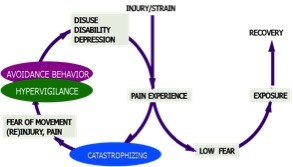 In the long term, fear can actually facilitate the development of chronic symptoms and disability. Our nervous system is sensitive and protective. Once the nervous systems generates neutral signals that the brain interprets as pain, the brain goes on high alert. The brain can actually lower the threshold for symptoms to occur- the nerves are overly sensitive and a less intense signal will register as pain in the brain. Hypervigilance and fearful expectations of pain can worsen symptoms. In fact, brain imaging studies on pain have found correlation between anxiety levels and activation in areas of the brain that process and respond to pain and those that process attention to one’s own body. An over-sensitized nervous system makes even harmless movements feel painful. No one wants to feel long-term pain, thus avoiding movements that bring on symptoms. Unfortunately, self-limited physical activity and resulting muscle disuse leads to weakness and more pain! But it’s not “all in your head.” Pain has a physiological response, both at the location of the symptoms and in the brain itself. How can physical therapy help? Physical therapists help people recover from injury and pain every day. If fear of pain is keeping you from activities you enjoy or simple activities of daily life, physical therapists provide the assurance and expertise so that you can regain confidence. Most importantly, physical therapists educate patients on their anatomy, condition, and treatment plan, so you can learn what to really avoid to stay healthy and active.